Coated Tablets: Box of 30. Each tablet contains: Phloroglucinol hydrated: 80 mg, Trimethylphloroglucinol: 80 mg.
Excipients: monohydrated lactose, sucrose, polyvinyl acetate, wheat starch, Stearic acid, magnesium stearate, talc, gum Arabic, gelatine, titanium dioxide, erythrosine, carnauba wax. 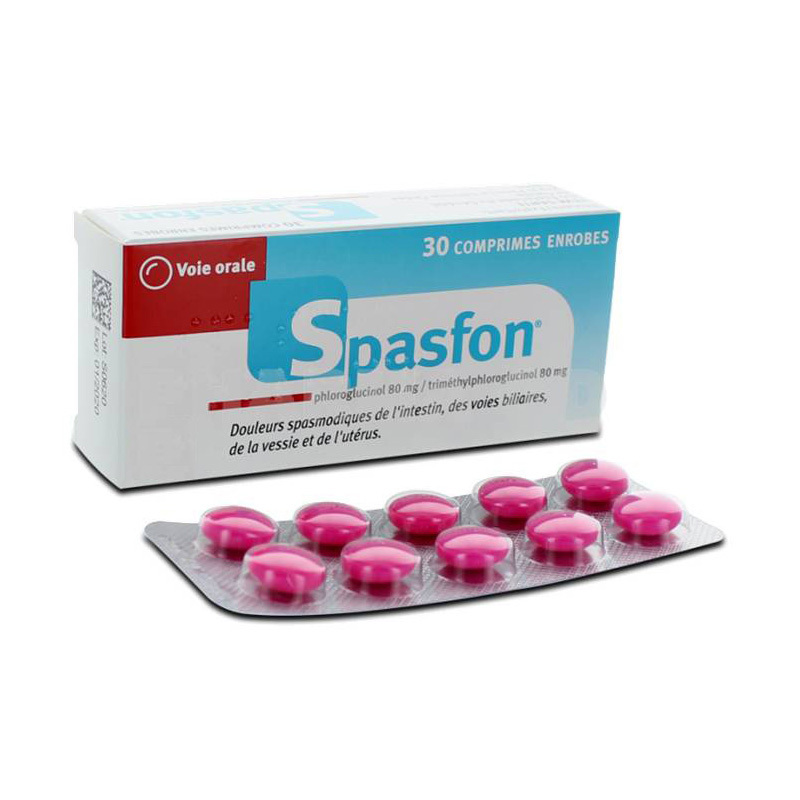 This medicine is intended to be used for the treatment of spasmodic pain arising from the intestine, biliary tract, bladder and uterus. Allergy to any of its constituents. Presence of coeliac disease. Because of the presence of sucrose, this medicine must not be used in patients with fructose intolerance, glucose- galactose malabsorption syndrome or sucrase-isomaltase insufficiency (rare metabolic diseases). Because of the presence of lactose, this medicine must not be used in patients with galactosemia, glucose- galactose malabsorption syndrome or lactase deficiency (rare metabolic diseases). List of excipients of which awareness is necessary to ensure risk-free use in certain patients: wheat starch (may be harmful in the presence of celiac disease), sucrose, lactose. Pregnancy: This medicine should be taking during pregnancy only if necessary. Lactation: Women should not take this medicine during breast-feeding. Skin and subcutaneous and allergic reactions: rash, rarely urticaria, exceptional angioedema, hypotension, anaphylactic shock.